Recently discovered this brand in Watsons. I realized that it's only available at a few exclusive outlets, hence it's not a mystery why I've never noticed the brand! It's not sold at the Watson's store that I frequent. 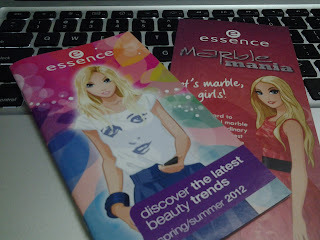 The brochures that I found at the counter were lovely and colorful! There's lots of products shown inside. This time round I only picked up one item, and I'm looking forward to try more! I picked up the souffle touch blush as I am out of cream blushes. There were only 2 shades available when I was there. I have a feeling that many of the items are snapped up very fast as soon as they are released as the shelves were pretty barren. Nonetheless I managed to pick up a color that suited my skintone and I'm really pleased with the blush! Shall do a full review of it soon, after I've used it for a longer time! I must say that the packaging for the products are lovely. I look forward to get more stuff when the items are restocked, and hopefully I'll find more goodies the next time I chance upon the essence counter!